Is your morning sickness more severe than normal? Check with your doctor. Although morning sickness is perfectly normal in a healthy pregnancy (and some even believe beneficial), it could be the sign of a more serious condition called hyperemesis gravidarum. Or, it could be a sign that you have twins or multiples on the way. If you are pregnant with twins, it’s all the more important to increase your Caloric intake. The old adage that you’re eating for two becomes a matter of eating for three. Even though the two (or more) that you’re carrying inside you are much smaller than adults, you’ll still need to bump up the amount of nutritious food that you eat. 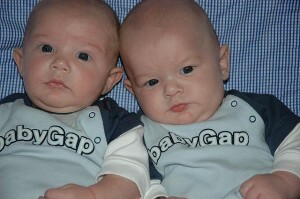 In most cases, mothers of twins should be taking in about 2,700 Calories per day. If you are carrying multiples, check with your doctor and nutritionist regarding your daily nutritional needs. Of course, if you’re dealing with a heavy case of morning sickness, increasing your daily intake is the last thing you want to think about at the moment. The first order of business is getting rid of the nausea and managing to actually keep something in your tummy. Keep soda crackers and ginger snaps on hand. Sip ginger ale throughout the day. Try to eat bland foods as much as possible. Hydrate with water and mild juices. Avoid smells with trigger nausea. If you’re having trouble keeping food down for a meal or two, it isn’t a big deal. That’s all part of the first trimester of pregnancy. If you can’t keep anything down for a full day or longer, or if you can’t even keep clear liquids down, let your health care professional know.